Yesterday in L.A. it was cold out. And grey. What I mean is, we had to wear socks & jackets. But we didn’t – we wore flip flops. I made a barley vegetable soup a few month ago and it was really good but this one is WAY better. I had bought a bag of dried split peas a few weeks earlier because I thought they’d be tasty but I wasn’t sure exactly what to do with them. 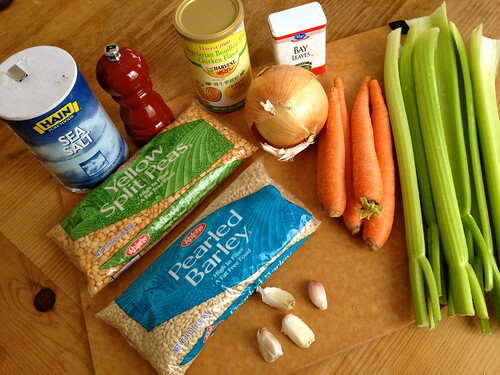 Since I still had some barley in my cupboard, I looked for a recipe combining the two and VOILA! With some adjustments I had a hearty, thick and really tasty soup. It called for croutons and since I didn’t have any I made ‘em! 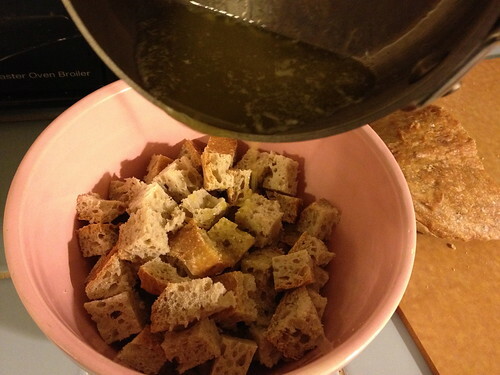 This is the first time and I want to tell you – make croutons as often as you have soup. They are REALLY easy to make & add that extra something that soup sometimes needs. 1. Saute chopped onions in the olive oil until soft and translucent, about 4 minutes. Add crushed garlic for another minute. Be sure to stir occasionally to coat with oil. 2. 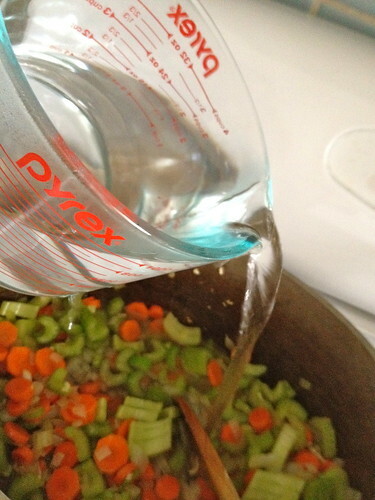 Add carrots and celery. Stir to coat with oil and sauté for another 3-4 minutes. 3. 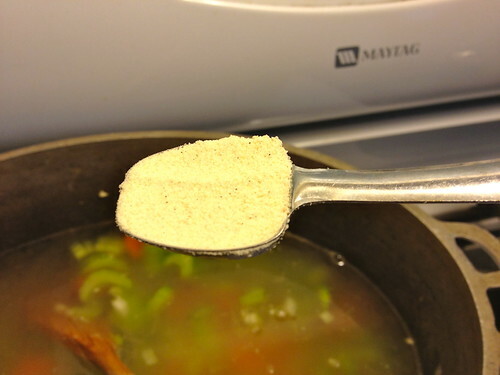 Add split peas and powdered bullion/water to pot OR vegetable broth. Cover and bring to a boil. 4. Reduce heat, add bay leaf and barley. 5. Simmer covered for about 2 hours. No, it’s not 1:20PM. 60 minutes + 60 minutes. D’OH!!! That’s a long time. 6. Season with salt & pepper to taste. Add water/broth as needed. I like my soup sort of thick so I didn’t. Sprinkle some croutons on top & serve. 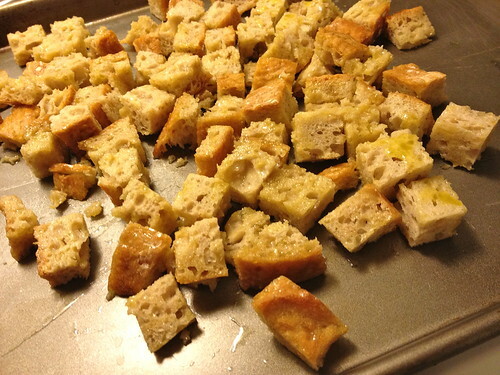 How to make the croutons?? 1. Preheat oven to 375. 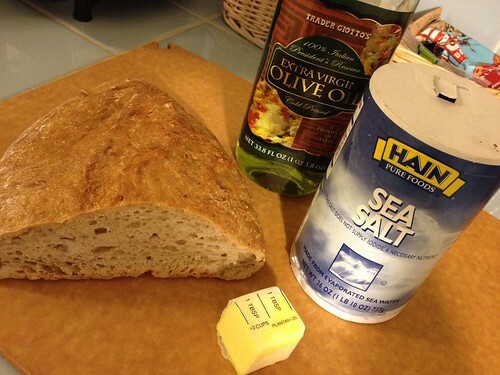 Cut bread into 1/2″ cubes. 3. Pour heated oil/butter and mustard over bread cubes & toss to coat. 4. Spread bread cubes across a cookie sheet evenly. 5. 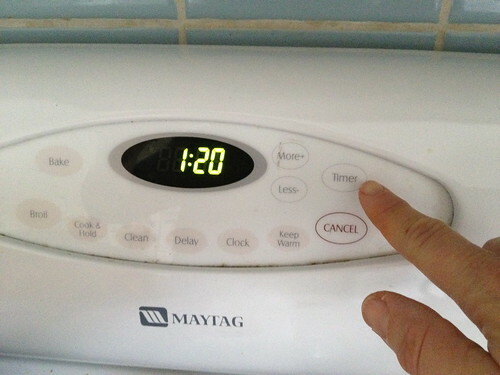 Bake for about 12 minutes. 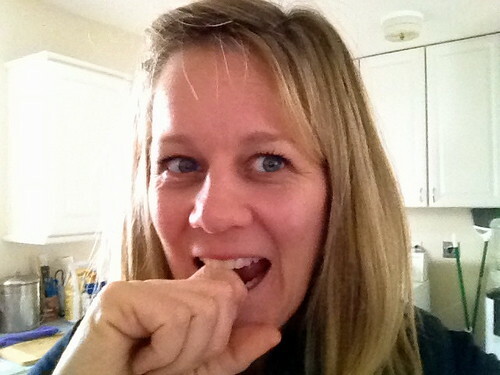 Taste one – it should be crunchy, not chewy. If it’s chewy return it to the oven for another 2 minutes. 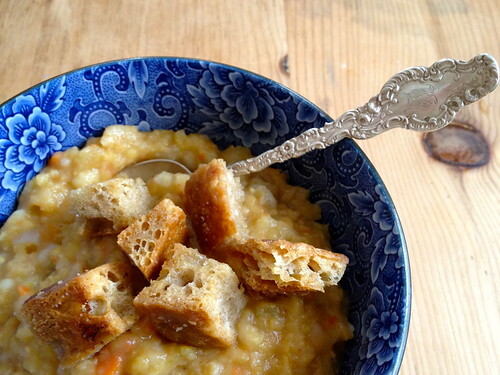 Hearty, thick soup topped with crunchy croutons. Perfect for a chilly afternoon! 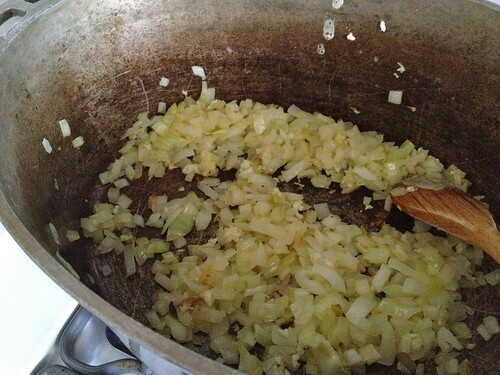 In a large pot, saute onion in olive oil for about 3-4 minutes or until translucent. 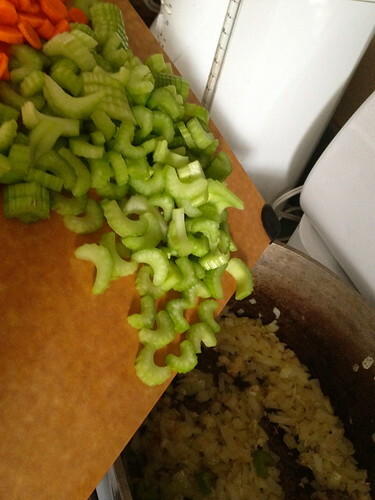 Add garlic & sautee for 1 minute more. Add chopped carrots and celery, sautéing for another 4 minutes. 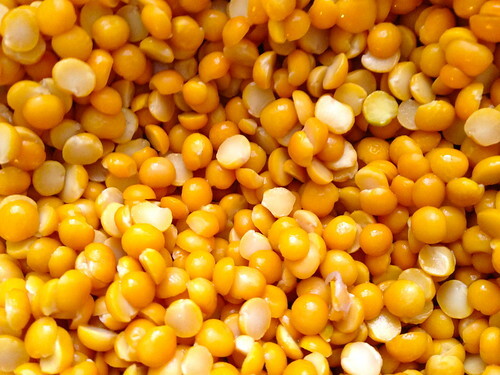 Add split peas and water/bullion OR broth (depending what you have on hand.) Bring to a boil, then turn heat down and add bay leaf and barley. Simmer for about 2 hours. Soup will be thick and cloudy (not clear.) Add water/broth to achieve your desired thickness. Or just leave it alone! Heat olive oil on medium-high heat in small saucepan. Add butter (or just double the olive oil and omit the butter). When butter is melted, in a medium bowl, pour over bread cubes. Toss to coat. Spread bread cubes evenly on a cookie sheet, salt to taste & bake for 12 minutes. Cool and test one cube. It should be crunchy. If it’s chewy, bake for another 2 minutes. This actually might serve more than 6. Good in refrigerator for 3-4 days. They will stay good in the freezer up to 3 months. I personally LOVE the helpers… and the pic of the chef calculating how long it would take to cook…. Recipe looks great. And nothing is better than the classic Christina pose! 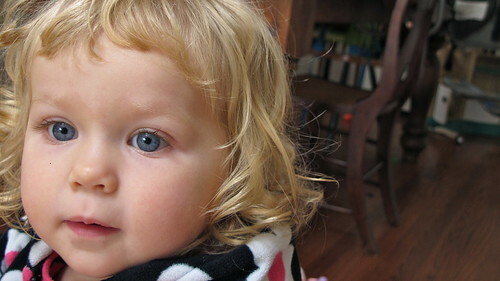 Plus, those kids are just stunningly beautiful. We found the site! This all looks so great, something we must try. Fantastic seeing you all, like nothing has changed. 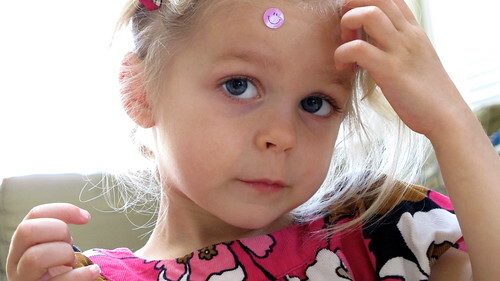 Busy with appointments and listening to heartbeats, its real! zigging zagging, more later. The Cox-Fitz Chronicles » Blog Archive Waste not, want…less?